The rotator cuff is comprised of four muscles and associated tendons that work together to keep the shoulder joint in the socket and enable movement in multiple directions. When one or more of these tissues is stretched, torn, or otherwise damaged, the result is a rotator cuff injury. The severity of these types of injuries range from minor strains that require rest and physical therapy, to severe tears that need surgical repair. Regardless of the intensity of the injury, damage to the rotator cuff almost always results in pain ranging from a dull ache to extreme discomfort, particularly while trying to sleep. Cold and compression therapy - The therapeutic application of cold, also known as cryotherapy, has been used for centuries to reduce pain and swelling from injuries. While this method remains valid, modern technology allows for better ways than the traditional ice pack or ice bath methods. Specialized wraps with chambers for cold water to flow through make cryotherapy treatments not only more effective, but also more comfortable because the application site does not get wet and you can control the temperature. These specialized wraps also have chambers for pneumatic air to flow through, compressing the injured area and creating a pumping effect that helps reduce swelling. The result is deeper penetration of therapeutic cold that also reduces pain for longer. Over-the-counter medication - Nonsteroidal anti-inflammatory drugs (NSAIDS) like aspirin and ibuprofen can help reduce the pain associated with inflamed tissues in the shoulder joint. While this option comes with limited risk, if you must take them for prolonged periods of time to alleviate shoulder pain, it might be time to consider a treatment approach that has more lasting effects. 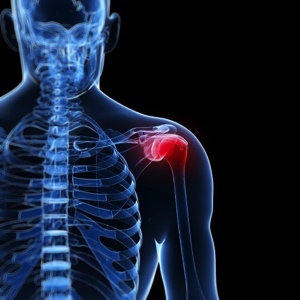 Prescription medication - If the injury is severe enough and a conservative treatment approach is not working to substantially reduce the pain, your doctor might recommend steroid injections into the affected shoulder. Although these treatments are effective, they come with inherent risks, so be sure you understand all of the implications before you make the decision to take this route. Always consult a physician before taking any medication, especially if you are already taking prescription drugs for another condition. Cold and compression therapy can be safely used at any time, so it is a good alternative or supplement to pharmaceutical treatments. If you are interested in learning more about cold and compression therapy and how it can help you reduce pain from a rotator cuff injury, talk to your doctor or physical therapist about Game Ready today.